A Philippine Hacker group claiming ties with the hacktivist collective Anonymous defaced early Monday several Chinese Government websites. "Anonymous Philippines" claimed responsibility for defacing more than 200 Chinese websites in retaliation for Beijing's aggressive actions in the West Philippine Sea, according to the messages posted on their Facebook page. "The operation was a success, we might not have brought China to it's knees but we gave hope to our brothers and sisters, because hope is what we need right now. Hope that someday people will stand-up and fight back!" Anonymous Philippines said. "China's alleged claim on maritime territories and oppressive poaching can no longer be tolerated. Stand against Oppression! It's time to fight back! 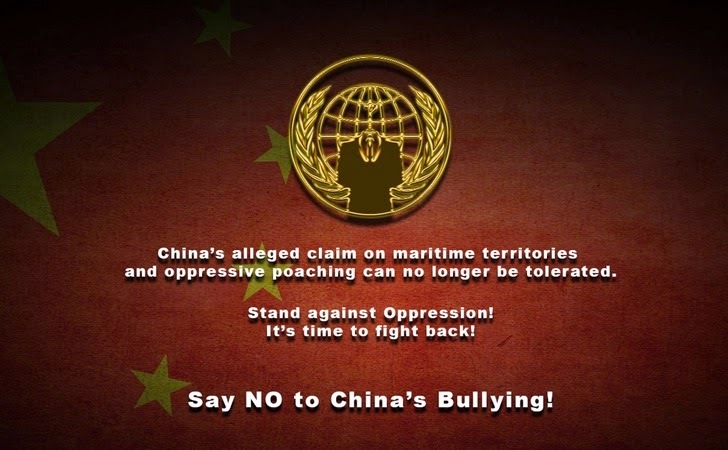 Say NO to China's Bullying!" The reason behind the defacement of websites is due to the conflict of alleged firing on the Filipino fishermen by the Chinese Coast guard and the arrest of eleven Chinese fishermen by Filipino police, who were charged for poaching a Critically Endangered species (555 marine turtles) and could face 12-20 years in prison. The defacement is the way of the Anonymous Philippines hacking group to strike back against China, over the territorial dispute on the ownership of the islands located between the Philippines and China in the West Philippines sea. This is not first time when the group has defaced government websites. The ‘Anonymous Philippines’ group is famous for defacing government websites. In 2012, the group gained the attention by defacing several Philippines government websites in the protest for the Cybercrime Law.